This little utility takes files of freeform ASCII/ANSI text as input and converts them to tokenised files. At 7 a.m this morning, a cold but bright day, I heard the birds sing, but they didn’t notice me. 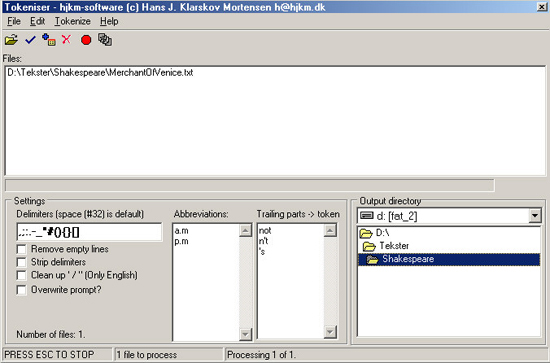 It works with multiple files, accepts abbreviations and trailing parts-of-words. See the help-file shipped with it for more details. I accept the terms stated above and want to download the Tokeniser. Once downloaded unzip the package to a directory of your own choice. Double-click the exe-file to run it.